Painter Marla Allison from Laguna Pueblo, New Mexico, has been awarded the Rainmaker Gallery 2018 artist residency, supported by ‘Beyond The Spectacle‘. During her residency Marla will be based in a studio space at The Bristol Museum & Art Gallery. She will teach workshops in local schools, and at the end of her residency Marla will be the keynote speaker for Indigenous Art in Britain, a symposium at Bristol University. The symposium culminates with the opening reception for her solo exhibition Marla Allison: Painter From The Desert, at Rainmaker Gallery. The exhibition runs throughout the summer from 6th June until 11th August 2018. “I am from Laguna Pueblo so I paint Laguna Pueblo. I am an artist who accepts the challenge of personal growth and innovation. I paint and create for Laguna history to be great and remembered. 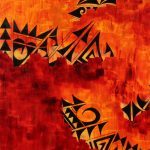 I paint because I was passed down a gift from my grandfathers; I paint to continue what they started. I began with simple works of loose brush strokes, slight symbols of pottery design, and shapes taught to me in my youth. I researched the artists that I found powerful and connected what they did with what I do. From study and admiration, I found that I had something all my own”. “Most of my influence is from pottery design of Laguna Pueblo and Hopi Pueblo. I have also found much influence by the cubism of Pablo Picasso and squares of Paul Klee. I don’t stick with one certain style but it is all my own, that’s what makes it mine. With the use of pottery design I have painted landscapes that have design on them symbolizing where the clay that holds these designs comes from. I have painted mosaic paintings that are broken up squares and by taking these paintings apart with the image, the viewer is forced to visually put them back together as a way of putting themselves and their past into it in the process. 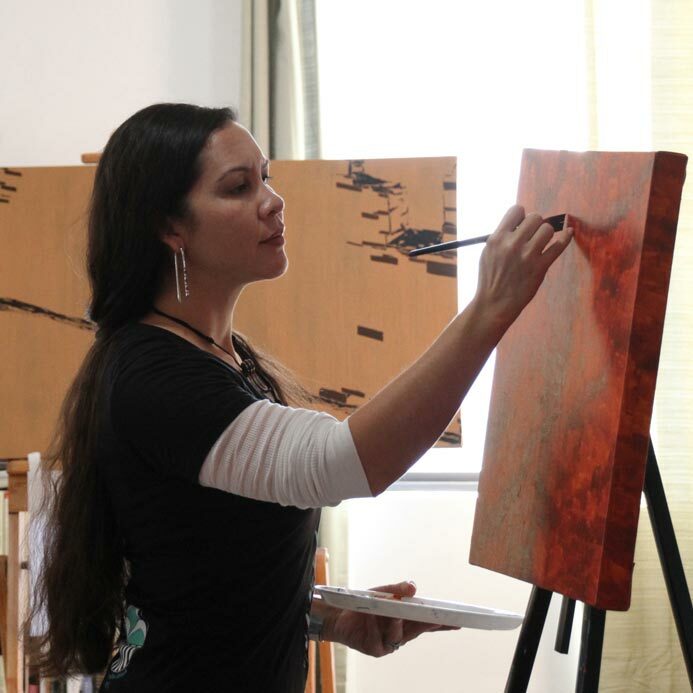 Marla trained at the Institute of American Indian Arts (Santa Fe, NM) and has an Associates Degree in three-dimensional art. She has exhibited at the Heard Museum, Santa Fe Indian Market, and the Smithsonian Museum (NY). Her work can be found in permanent collections at The Heard Museum (Pheonix, AZ), The Museum of Indian Arts & Culture (Santa Fe, NM), Red Cloud Indian School (Pine Ridge, SD) and private collections around the world. In 2010 she was awarded the Eric and Barbara Dobkin Native Woman’s Fellowship at the School for Advanced Research (Santa Fe) and in April 2017 she travelled to the Abu Dhabi Art Hub (United Arab Emirates) for a month long residency. In addition to paintings Marla Allison has created a range of jewellery in collaboration with celebrated artist & jewellery maker Pat Pruitt. Read an interview with Marla Allison from her artist residency here.